Enjoy a magical getaway at Red Lion Hotel Orlando - Kissimmee Maingate, a top choice as a hotel near Disney World , and featured on Lifetime's Military Makeover. 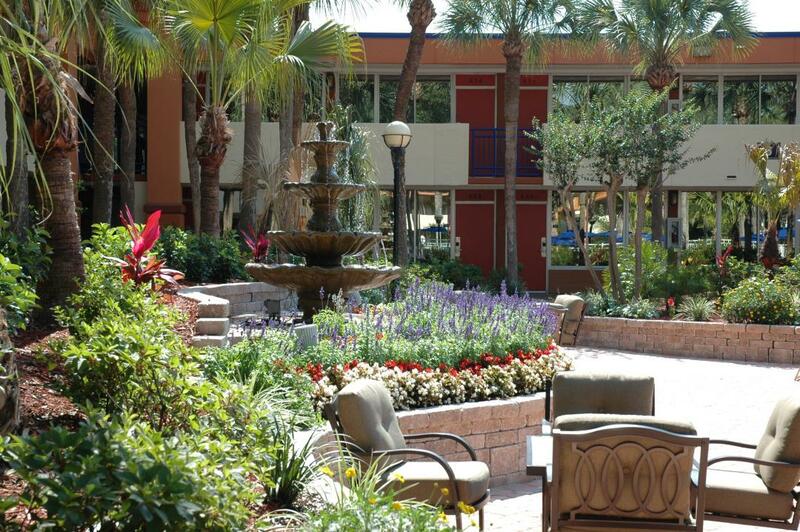 Situated in the heart of the action, our guests enjoy the easiest access among Orlando hotels. Vacation on 16 spectacular landscaped acres featuring three pools, two fitness centers, and comfortable accommodations. Our hotel near Magic Kingdom and Disney World also has onsite hotel amenities to make your stay even better. Host your event or wedding reception in one of our four event rooms, then head to our landscaped courtyard for a picturesque photo op. Take advantage of our specials and packages to get the best value during your vacation. Whatever brings you to Orlando, we have accommodations and amenities to meet your needs. Our Disney World hotel and the area's best attractions ensures you'll enjoy a memorable vacation. We have more than just comfortable accommodations at our hotel near Disney World. Relax in our three outdoor heated pools, or work out in our fitness center and tennis courts. With free high speed Wi-Fi and complimentary HBO, you'll also have all the entertainment you need in your room. Visiting Disney World Resort and other parks is easy, too. Our complimentary shuttle takes you right to the gates. Experience the best choice among hotels in Orlando with Red Lion. Featured on Lifetime's Military Makeover®, Red Lion Hotel Orlando Kissimmee-Maingate is supportive of the Men and Woman who serve in all branches of our country's military. Thank you for your dedicated service and sacrifices for the United States. To view our hotel on Military Makeover®, view the video below. We're proud to serve those who serve. To give back to those who serve, RLH Corporation (Red Lion Hotel Corporations) and Red Lion Hotel Orlando Kissimmee-Maingate, teamed up with the Lifetime® TV mini-series, Military Makeover®. The show enlists the help of design and home renovation experts to transform the homes of military families across the country. RLH Corporation welcomed Lance Cpl. Michael Adams, a wounded war veteran, and his family to a stay at Red Lion Hotel Orlando–Kissimmee. The Adams family enjoyed their time away from home with tickets to Walt Disney World theme park, provided by RLH Corporation. The reveal was featured in a three-part episode that aired on August 18, September 8th, September 15th and September 22th. It is easy to get around on your vacation with Red Lion Hotel Orlando. We have a free Disney shuttle, and we're happy to provide alternative options for your stay. Just choose your method: car, bus, or taxi. We offer free parking, making it perfect for drive-in guests. Prices: $15 per person to Universal Studios and $13 round trip per person to Sea World. *Only picks up from the Magic Kingdom® on nights where the park closes at midnight. Bus: Lynx offers bus service near our hotel. Call (407) 841-5969 or visit their site. The Greyhound stop is located on 111 East Dakin Avenue. Rental Car: Action Car Rental is our on-property car rental service. Call (407) 240-0771 to reserve. Taxi: Platinum Transportation offers both Limo and Taxi service as well as a shuttle to Walt Disney World. Call (407) 492-8888 to reserve. UBER/Lyft: With clean and friendly service, it is fast and easy to use right on your mobile device. Note: Please see Guest Services to pay and obtain a transportation voucher before departing from the hotel. Vouchers are for round trip services. Guests' vouchers will be checked upon boarding and will not be permitted to board without a voucher. For additional shuttle information please call our Shuttle Dispatcher at (407) 792-8888. Come experience the best choice among hotels near Disney Maingate. 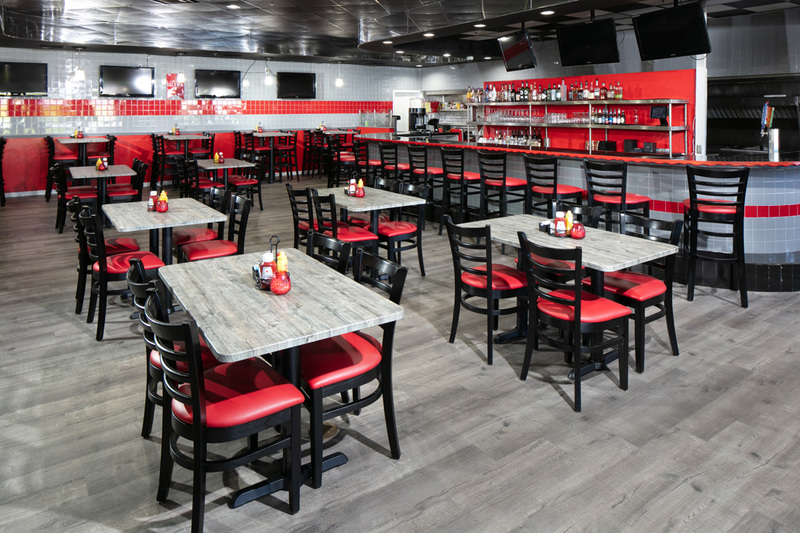 After a long day at the parks stop in at Reds Bar and Grill and relax and watch your favorite sports from one of our eight HG televisions. Try one the islands favorite Bushwacker and relax in our cozy lounging feasting on a juicy burger and chatting with one of our friendly staff. Or soon, go next door and grab a hot pizza from our very own Pizza Hut. Visit the Breakfast Spot for a Breakfast Buffet every morning. Explore the area our Orlando hotel to discover festival fanfare at Medieval Times, hearty steaks at Charley's, and historic dining that even the locals like. Get your fill before coming back to our accommodations for a good night's sleep. Medieval Times Dinner and Tournament. Stay at one of the closest hotels near Medieval Times Orlando FL for a trip back in time. Sit ringside at a show of bravery and honor with a live jousting tournament. Dine on a four-course meal fit for royalty. Columbia Restaurant is a Florida tradition. Opened in 1905, it was named one of America's most historic restaurants by USA Today, and it overlooks Celebration's picturesque lake. Charley's Steakhouse & Seafood Grill won a Diner's Choice award in 2015, and it provides guests with high-quality steaks. 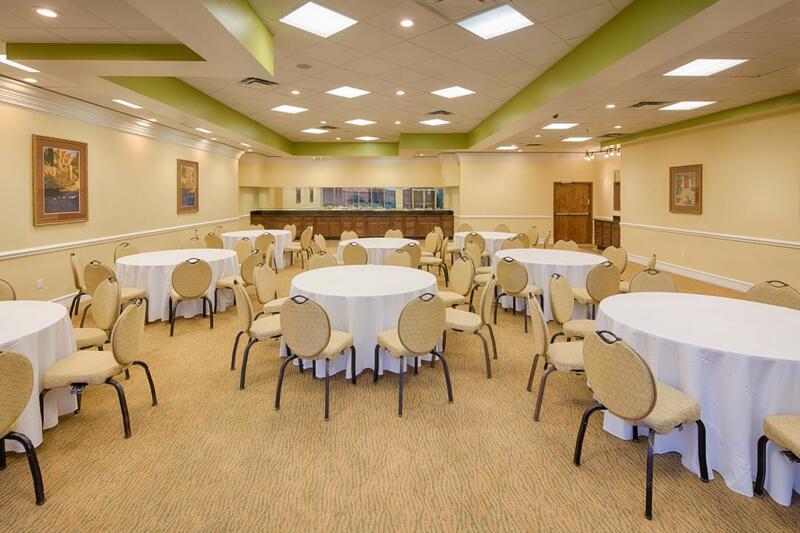 Our newly renovated Orlando event venue offers four rooms and more than 5,000 square feet of flexible space, not including our beautifully landscaped courtyard area, that can be used for wedding ceremonies or family reunions. In addition to our convenient meeting space in Orlando, our professional event team is available on-property to take care of all your needs, including AV services, wedding planning, and full-service catering through hotel approved vendors. We also offer group room rates, for your wedding party or travelling sports team. To learn more about our event venues in Orlando at Red Lion, contact us at (407) 396-7300, or complete a request for proposal. We look forward to speaking with you soon. When you host your event at Red Lion Hotel Orlando, we take care of the details. You will have access to an expert catering staff, our convenient Orlando event venues, and full-service catering through hotel approved vendors. Whether you are hosting breakfast, lunch, or dinner, or looking for an a la carte menu, we give your attendees a delicious selection of food to savor during your event. Let our dedicated event staff help you make the most of our meeting space by arranging set up of all necessary AV equipment and providing a menu of delicious food. Because we understand that there are always last-minute tasks to take care of, our hotel offers a business center for added convenience. To learn more about our catering vendors and other event needs, please contact us today at (407) 396-7300. Whether you are planning a family, high school, or corporate reunion, we want to be your preferred hotel when searching for your next event. Offering discounted room blocks, Red Lion Hotel Orlando - Kissimmee Maingate is the perfect choice. 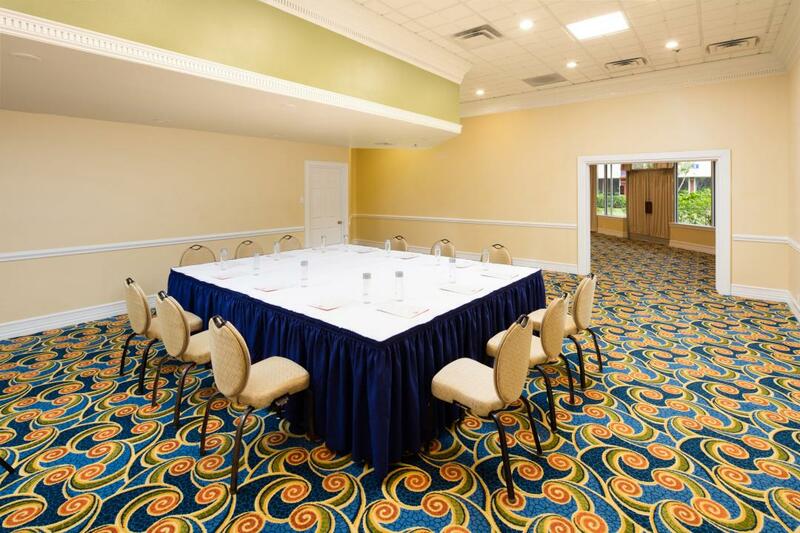 With comfortable accommodations, ample onsite parking, flexible meeting space, and free Wi-Fi, our Orlando hotel provides the amenities your guests need. Call for a quote on your next event or room block at (407) 396-7300. Situated in the heart of the action, our guests enjoy the easiest access among hotels near Disney World Resort. Vacation on 16 spectacular landscaped acres featuring three pools, two fitness centers, a rejuvenating spa, and comfortable Orlando hotel accommodations. We're a short drive to Disneyland's Magic Kingdom, and Universal Studios is also only a few minutes away. Enjoy our Free Disney World Resort Hotel Shuttle on your next adventure. Upscale shopping, prestigious golf courses, theaters, and more area attractions are waiting for you in Orlando and Kissimmee. Need a room for your group to gather? Let us know. Our dedicated staff welcomes you to make our space your home away from home. Don't forget to ask about our catering options or let our team help customize something for you today. 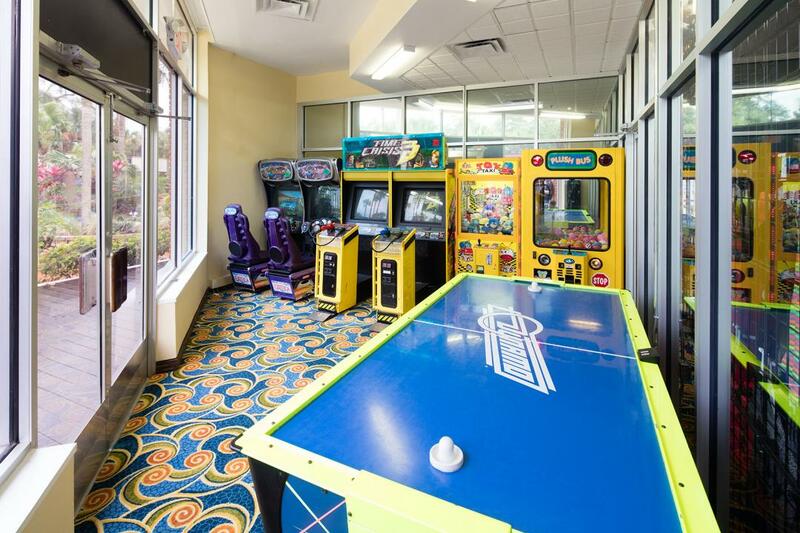 An ideal home base for sports fanatics, Red Lion Hotel Orlando - Kissimmee Maingate offers youth sport group rooms for teams and guests in town for the big match. From soccer, hockey, and football games, to baseball, softball, and beyond, our travel options for collegiate, club, and Orlando youth sports are sure to be a home run with your group. And you'll find yourself minutes from the most magical place on Earth, with Disney World® deals that invite you to celebrate, unwind, and soak in the Florida sun. We make team outings easy by offering ticket purchase in our hotel lobby. Buy theme park tickets upon arrival for your team. Please contact the hotel to inquire about sports and group travel packages at (407) 396-7300. Start your love story at Red Lion Hotel Orlando - Kissimmee Maingate and take advantage of a romantic setting for ceremonies and receptions. As a standout among Orlando wedding venues, we strive to help you create celebrations that make your special day a memorable occasion. We are confident that our outstanding staff and facilities will make this a celebration remembered for years to come. From intimate gatherings to banquet affairs, Red Lion Hotel Orlando - Kissimmee Maingate is dedicated towards helping you organize the Kissimmee wedding of your dreams. Ensuring that no detail is overlooked, we’re happy to take care of the details. Create memories that last a lifetime at our romantic Orlando wedding venue and relax while we take care of the rest. Contact our sales team at (407) 396-7300. There's always something new to do in Orlando. The attractions and activities surrounding our hotel provide a diverse dose of fun, from great dining to exciting entertainment to famous amusement parks. 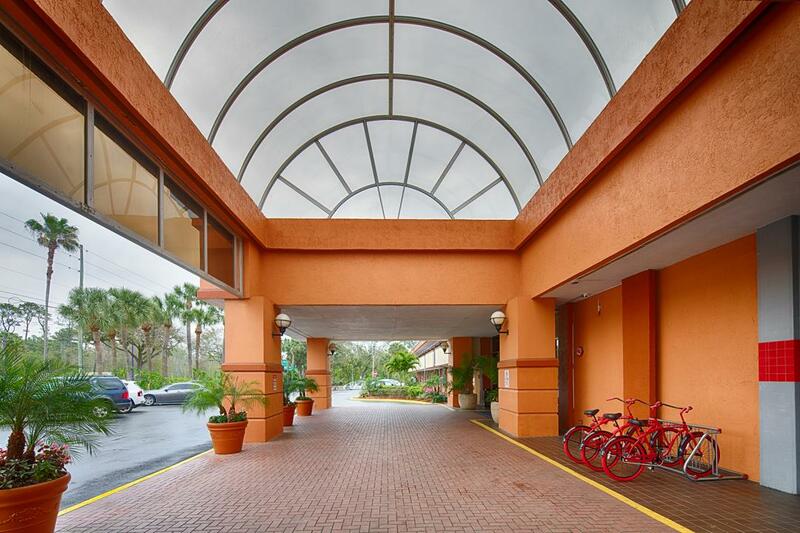 Red Lion Hotel Orlando is just a short trip away from Universal Studios, Walt Disney World Resort, and other Kissimmee amusement parks. Legoland, The Crayola Factory, and the Epcot Center are also all ideal family activities. If you are looking for an exciting night out, head to The House of Blues or Cirque du Soleil. 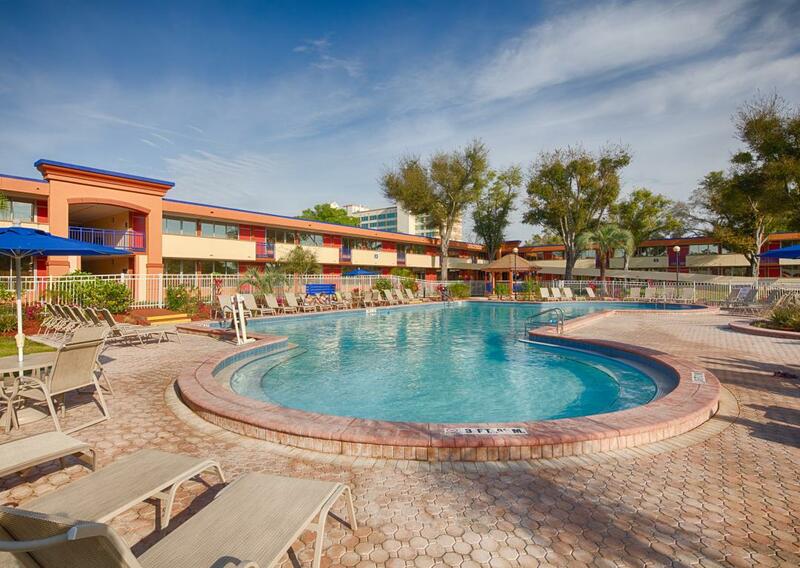 There's no better choice than Red Lion for a family-friendly hotel near Magic Kingdom Park. Don't forget to ask our friendly staff about transportation and discounted tickets in the area. Our friendly staff would be happy to help get you on your way to a fun-filled day. Red Lion Hotel Orlando - Kissimmee Maingate opens the doors to a Disney adventure. During your next Walt Disney World® Resort trip, be sure to take advantage of the many things to do near Walt Disney World® Resort and embark on a whole new world of excitement for kids of all ages. With a variety of attractions within easy reach, you will enjoy a magical getaway at the top hotel near Disney World® Resort. Magic Kingdom® Park: Discover what fairy tales are made of as you enjoy fireworks, musical parades and meet-and-greets with your favorite characters from Tomorrowland, Adventureland and beyond. Epcot®: Head to Futureworld and discover technological innovations that will fill you with a sense of wonder before visiting Epcot World Showcase, offering immersion in the culture and cuisine of 11 countries, all in one convenient location. Disney’s Hollywood Studios®: Only a quick 10 minute drive, and you can be the star of the show when you step into Hollywood’s Golden Age. Enjoy attractions based on top TV shows and movies as you stroll through Sunset Boulevard, Pixar Place and other family-friendly areas. Disney’s Animal Kingdom® Theme Park: Located 2.5 miles from the park, spend time with your favorite exotic animals in our back yard when you visit Kingdom Park. Go ahead -- there’s no better time or place to encounter more than 300 species. Disney’s Typhoon Lagoon Water Park: Splash down in the rapids, lie on sandy beaches and enjoy relaxing raft rides at the Typhoon Lagoon, a Disney water park in Orlando. Disney’s Blizzard Beach Water Park: Hit the slushy slopes and discover an adrenaline rush on some of the fastest water slides before relaxing with sun and warm weather in this ski resort-turned-water park. Looking For A Deal on Hotels Near Disney World? Let the magic begin on your next adventure to Walt Disney World® Resort. We are now offering a discounted package for stays three nights or more that include a $100 credit towards the purchase of two, 3 Day Disney Park Hopper Tickets or Longer. Our Walt Disney World® Resort hotel is one of the closest hotels to Disney's Main Gate. Start planning your next trip to our hotel near Disney Orlando. You will never run out of Orland family activities. 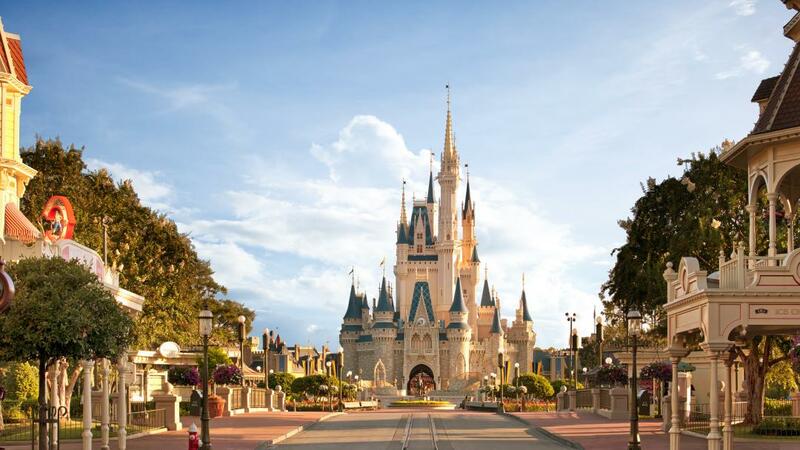 The best in the nation are here, with famous, unforgettable parks like Disney World, Legoland, and Universal Studios. Our hotel in Orlando has a central location that makes it simple to travel to these nearby attractions. Awesome awaits at LegoLand. The park is divided into separate themed areas, with places like Lego City, Cypress Gardens, and Pirate's Cove. The park has rides for toddlers, like the Duplo Train, and a waterpark for big kids. Kids can get their own Lego Minifigure. Model Citizens (the park's employees) have their own Minifigures, which kids can trade for if they want. The famous Epcot Center has everything you need for a memorable afternoon. Attractions include an outer space adventure and top secret spy training. Dine on American and international cuisine with your favorite Disney characters. View dolphins up close and see more than 6,000 sea creatures. The Epcot Center also hosts live musical performances, stunning fireworks displays, and many more events throughout the year. A family trip to Disney World isn't complete without a visit. Have a day of hands-on colorful, creative fun at The Crayola Factory. Kids can do everything from decorating a coloring page to crafting a vibrant sculpture to animating their own digital creation and playing it on a large projector. Let your child's artistic creativity run wild, and paint the town red (or Tickle Me Pink, or Mauvelous). Come experience the best family hotel in Orlando with Red Lion. 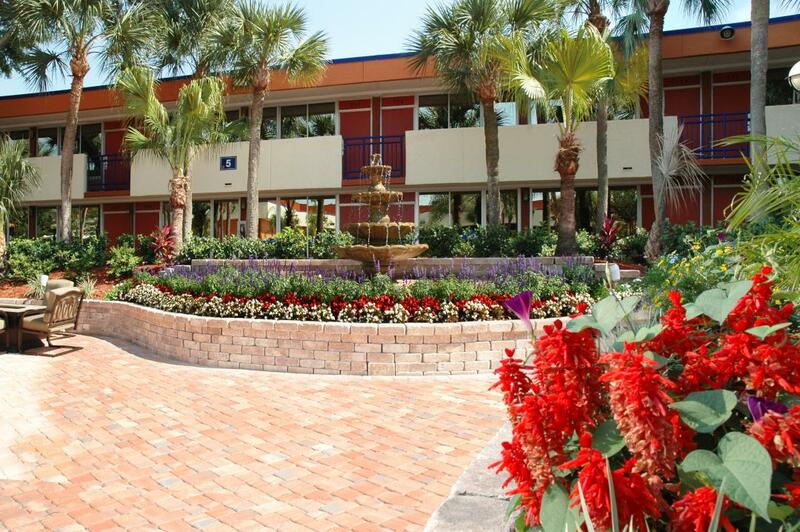 Red Lion Hotel Orlando offers guests easy access to Kissimmee Lakefront Park, less than 20 miles away. On the scenic shores of Lake Tohopekaliga, visitors will find pathways for walking and jogging, fishing and boating piers, pavilions for outdoor entertainment and festivals, BBQ grills and playgrounds. The park has also been designated as a State of Florida Birding Trail. If you get hungry and haven't packed your picnic basket, head over to the concession stand selling food, beverages and snacks. The park boasts boat ramps, boat slips for annual rental, and a stunning lighthouse with a theatrical lighting entrance feature. Additionally, the Big Toho Marina owned by the city sells bait and fishing tackle and has a small restaurant. Within the park, visitors will find the Berlinsky Community House, a historic building available for rentals, as well as the 50,000 square foot Kissimmee Civic Center, which houses a full gymnasium, meeting rooms, and exhibit space for a variety of private, public, and athletic functions. There's available arena seating for 3,000, and meeting room seating for over 400. Kissimmee Lakefront Park hosts a variety of events throughout the year, from celebrations of Caribbean culture to fresh farmers markets. See what's happening during your stay at our hotel near Kissimmee Lakefront Park. 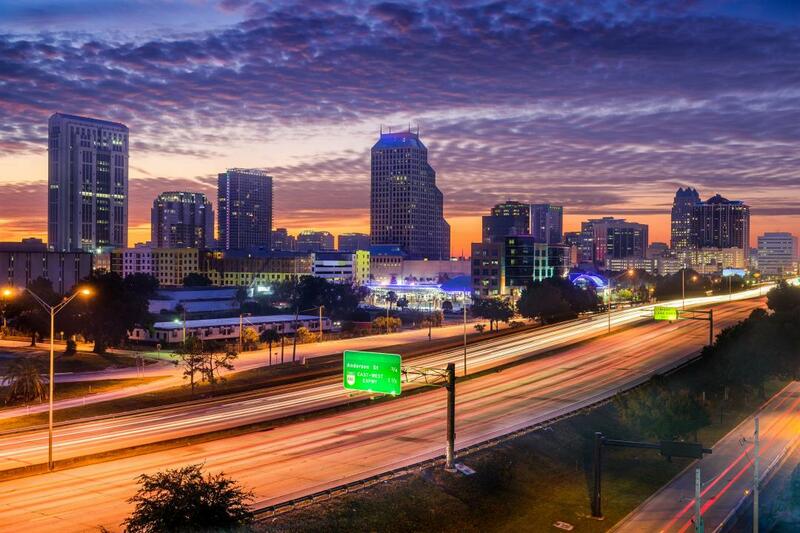 The streets are alight with Orlando nightlife. There are many kid-oriented amusement parks nearby, but there are also plenty of attractions for adults. With boardwalks, dining, bars, and Florida's signature beautiful weather, you will have plenty to do at night during your stay at our hotel in Orlando. Here are our prime nightlife picks. Music feeds the soul at House of Blues. See the biggest and upcoming names in country, blues, and rock perform as they come through town. Daily happy hour starts at 3 p.m., and the kitchen features classic American dishes with savory international influences. Try the ribs from the restaurant's traditional BBQ smokehouse. Old Town has dining and shopping in a nostalgic USA setting. Their full-service restaurants include Bamboo Court, TexMex Express, and Flipper's Pizza. Weekly Car Shows showcase retro cruisers, motorcycles, and muscle cars. Brick walls and oak-barrel tables create a warm, inviting atmosphere in Brewery Barrel. Select from beers and wines from all around the world. The bar features 160 beers, coming from more than 30 countries. Cirque Du Soleil is a colorful, exciting evening of acrobatic thrills. La Nouba sees two worlds collide: the colorful world of the circus artists, The Cirques, and the dark, monochromatic Urbains. When these two worlds collide, the Cirque's amazing feats set fire to the pale mundanity of the Urbains. This quarter-mile promenade has just about everything a night out needs. See dueling pianos battle each other for musical supremacy. Restaurants offer full course meals or quick, on-the-go sweets. Play classic arcade games, or cruise along the boardwalk on a bicycle built for four. Experience the best choice in hotels in Orlando with Red Lion. Orlando is home to some of the world's most famous parks. A standout hotel near Walt Disney World®, Red Lion offers a shuttle that leads directly to the park, giving you and your family easy vacation travel. Our hotel is also near Universal Studios, SeaWorld, and many more all-ages destinations as well. Walt Disney World® Resort is the quintessential family vacation. Perfect for kids and adults, Walt Disney World® Resort takes you through streets brimming with your favorite Disney® characters, as well as famous thrills in the Haunted Mansion® attraction, Tommorrowland® area, and the Pirates of the Caribbean® attraction. This sprawling park has something for everyone to enjoy. Disney's BoardWalk Entertainment District has charming dining, entertainment, and shops. Disney's Animal Kingdom® Theme Park, showcases exotic creatures like lions, giraffes, and elephants. Enjoy a magical day (or days) at Walt Disney World® Resort. Universal Studios is a massive series of parks with everything you can imagine. At The Wizarding World of Harry Potter, get sorted into their house, buy wands, and shop Diagon Alley. Universal CityWalk has dining, entertainment, and nightlife along the waters. More than 25 rides feature characters from Despicable Me, The Simpsons, and Transformers. Islands of Adventure feature twisting roller coasters, while Wet 'N Wild Waterpark provides splash-worthy adventure opportunities. See the vibrant, diverse aquatic wildlife that inhabits Florida's Gulf Coast waters when you stay at our hotel near SeaWorld. Dolphins, seals, and whales are all on display at this aquarium and theme park. Shows like Sea Lion High and Blue Horizons combine colorful sets with amazing feats. SeaWorld Orlando lets you meet the dolphins on the Dolphins Up-Close Tour. The hour-long tour lets you interact with Atlantic Bottlenose Dolphins, and even learn hand signals to communicate with them -- all without getting in the water. Learn more about the ocean's diverse wildlife at their many other shows and demonstrations. This 220-acre sports complex is like Walt Disney World® Resort for sports fans, coaches, and athletes. Watch youth sports participants play out championship and exhibition games in almost every sport, including football, baseball, basketball, soccer, volleyball, lacrosse, and much, much more. The complex also has plenty of dining options for you to fuel up before or after games.